My wife and I fell in love with Barbary Spirit on first sight. We had been to see several yacht’s up and down the country, and although they were all lovely, for us they lacked that certain something. We saw the advertisement on the internet for this Barbary ketch and as it was a Saturday and only an hour and a half distance from home by road we decided that we would take a look. There she was perched up on her wooden props and we loved her shape immediately, a bit like an old fashioned pirate ship. She was very run down, her owner had sadly died whilst he was renovating her to glory, but, my wife and I are always up for a challenge and loving what we saw thought in our wisdom that we had all the time in the world to bring her back to her full potential. Whilst we did a huge amount of work to bring her up to sea worthiness we thought that once we got her to her new home in Conwy we could fulfil our plans of making her truly wonderful, after all everyone admired her and she received lots of great comments from fellow sailors… Unfortunately fate played a hand insomuch as our business workload increased and time became very short in the leisure area. We spent less and less time doing what we love and Barbary Spirit never gained the sparkle in the form of cosmetic work that we had intended. 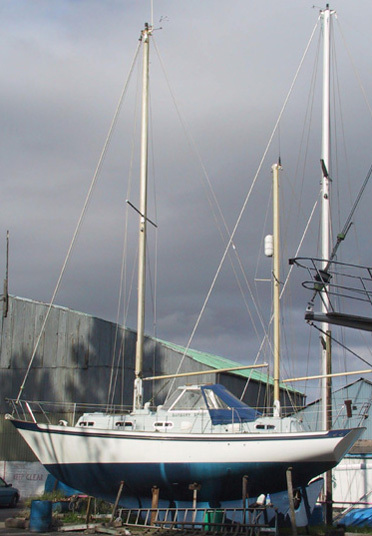 So one good loving home was required for a great craft…..
She is now owned by ex-trawlerman Patrick (Don) Kelly from Dublin and he has promised to treat her with the respect she deserves. Barbary Spirit is a Barbary Class Power Ketch designed by Walter Rayner and built in 1974 by Frederick Mitchell and Sons Ltd of Poole.She is 9.91m overall length and is powered by a Mercedes Benz 42.h.p diesel engine. Spirit had been waiting for us to find her in a boat yard at Hesketh Bank near Preston. She had been found by me when I was researching the possibility of transporting a boat from the south of England to North Wales. The transport company that I discovered had an association with Coburg Yacht Brokers who had an advert on their web site for a Barbary Ketch. We phoned the contact number and spoke with Tim Major who explained that she was out of the water at Douglas Marineat Hesketh Bank near Preston. We were told that she had been out of the water for a number of years undergoing renovations including osmosis treatment and engine overhaul. Unfortunately the gentleman passed away before he could sail her again but we understand that she had been to the Norwegian Fjiords and the Eastern Med in her time. We fell in love with her immediately so we bought her and spent another £5000 having lots of essential work done before taking her back to Conway. Andrew Upton on Almost very serious!! !